As Nine Muse Press kicks off our Orison release week extravaganza, I thought I’d take a look back at the journey with this book. The job of an editor is a strange one. After all, any decent word-processor can catch spelling or grammar errors. My job is to cut away the excess verbiage, the clumsy sentences, the lazy cliche, drag away all that obfuscates the luminescence of the author’s vision. If a scene is in the wrong place, if the pacing is off, if a character is redundant, if the ending is weak, if the opening is slow…these are the places where I come forward with ideas to improve. They are only ever ideas; the author has the last word. But I see the potential in a manuscript. Once I get it, the work has just begun. I do not sell my services. That is to say, I don’t work as an editor for an hourly rate (though it would doubtless be more lucrative). I only edit books that Nine Muse Press accepts for publication. If I’m doing my job right, the author may struggle with whether to strangle or hug me at any given moment. Perhaps I should take a step back and relate why fantasy matters to me. When I started reading as a child, the fantasy genre was my first love: a common story with gawky, socially-awkward and shy girl. It swept me away to misty mountains, to faery bowers, to the Mines of Moria and the snowy woods of Narnia. I will read fantasy till I die. It wasn’t until I got older that I realized that the protagonists were almost never like me: that is, a girl who was neither beautiful nor magical. Though there were a few notable exceptions, they were usually male: callow youths or hardened swordsmen. 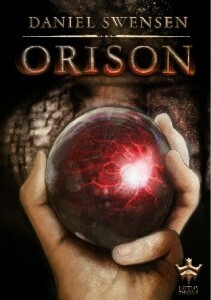 When I first read Orison, I was intrigued. Calushain felt real to me, those who peopled it felt real too. There was one secondary character named Story that I fell hopelessly, irrevocably in love. Story was not beautiful nor magical. She was an ordinary girl who had been dealt a rough hand, then been given an extraordinary chance to change her life forever. We decided Orison would be the second novel that Nine Muse Press released. And then Daniel and I started scrubbing away at the book to make it gleam. If we were content with just releasing a pretty good book, we could have published it three or four months ago. That is, a book with no errors or typos. But it would not be the book it is today. Today, I am privileged to announce that on the last day of February in the year two thousand and fourteen, Daniel Swensen’s Orison will be a reality and you will be able to download it to your very own e-reader. Paperbacks are next, fear not, ye fellow Luddites of mine. We have so many wonderful things in store for you this week. Every day, there will be a brand new post from a Nine Muse Press Affiliate blogger that celebrates a different character in the book. Be sure to check them all out this week, as they will have a ton of exclusive, never-before-released content. I have them listed below for your reading pleasure this week. Friday, Feb. 28: HAPPY RELEASE DAY! This book represents a tremendous amount of work and love and I am terrifically proud to be a part of its inception. My most sincere gratitude to my NMP partners, Paul and Tina Ramey. And, to Daniel, for sharing your world with us. Some of you may recognize the name Tristan J. Tarwater. 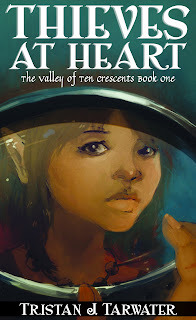 She is the author of The Valley of Ten Crescents Series: Thieves at Heart and the soon-to-be released Self-Made Scoundrel. She also recently released Botanica Blues, an homage to Lovecraft, as well as contributes regularly to Troll in the Corner. You can read the excellent feature of her on Surlymuse.com. Follow her on Twitter (@backthatelfup). Tristan is a self-described Dork Mom and Geek Dame. Plus, she has vertical hair. She writes fantasy novels. More importantly, she writes GOOD fantasy novels. Her work is awesome and so I recently pushed her Kickstarter effort in its final hours. She raised over $1500 from 62 devoted fans (of which I was one), which is over double her goal! On the Kickstarter page, she mentioned she was considering doing an audiobook for Thieves at Heart. On a whim, I read the first chapter of Thieves at Heart into my iPhone and sent it to her. She loved it and so, HERE IS THE BIG ANNOUNCEMENT. 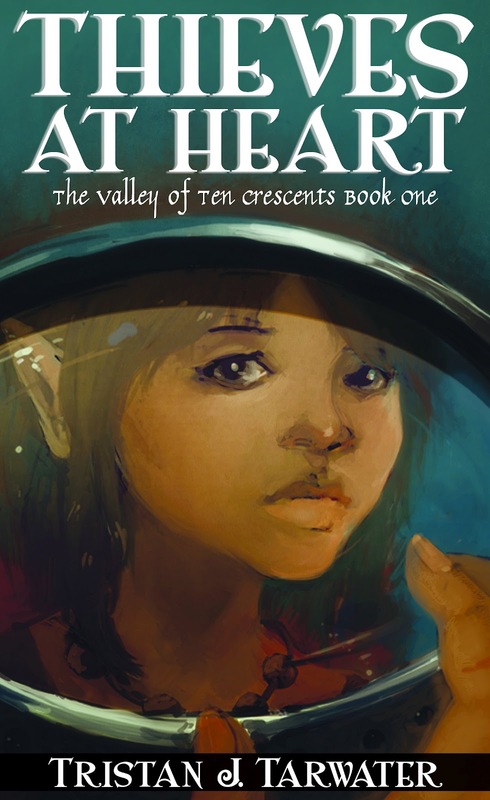 I will be recording the Thieves at Heart audiobook. I’m am excited and honored to be part of this amazing project. It’s ambitious (54,000 words! ), but I feel up to the challenge! More updates to come. 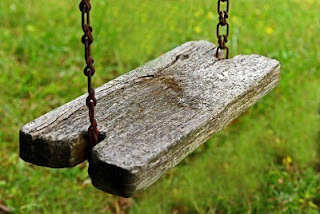 In his first flash fiction competition ever, Thomas Loy has sent us a piece full of nostalgia. As I long to stay awake, I can feel slumber being forced upon me and the thoughts of heaven and home begin to lay me down to sleep. 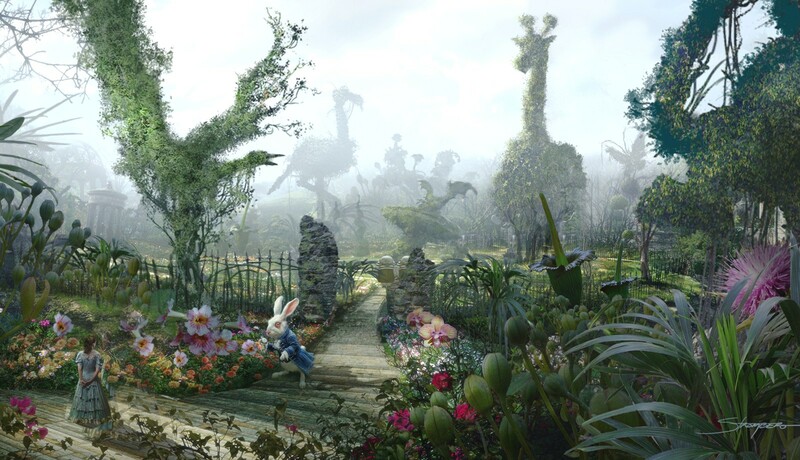 As the sleep fairy takes me away to slumber town, I can see my home in Tennessee at the bottom of the long hill with the weeping willow tree and my big back yard. I saw the world in my backyard. The Big Orange played and beat Alabama everyday. The ivy walls of Wrigley Field and the maple tree was the big green wall at Fenway Park. The smell of fresh cut grass in the summer and fallen leaves in the fall. A picnic table to eat peanut butter sandwichs and drink cherry Kool Aid on hot summer days. Dogwood trees were magic tents. Evel Knievel rode and Bear Bryant stood, leaning against the old oak tree. Normandy Beach was stormed many times and the battle always interupted by the call of my loving grandmother offering homemade biscuits and freshly fried chicken. It’s where my first dog had her puppies. The Lone Ranger chased a thousand outlaws there. The swing where I stole my first kiss. Summer days and magic ways. Life has never been as simple since. I believe there is a heaven. I believe we go as kids and our family waits patiently for us with outstretched arms, because heavens just another place just like my big back yard. This entry courtesy of Victoria Boulton. A unicorn! She was luminous with beauty in the silver light. My inner-child rose up from the depths of my heart, dancing and laughing. I wished that I had never silenced her and had dared to believe. I came out from behind the tree trunk and held out my hand as you would to a skittish pet. “Hello.” My voice was soft with nerves and stupid with wonder. The unicorn snorted and pawed at the ground, and I thought she would flee, leaving me forever wondering. But then my heart soared up on a wave of heat and happiness as she approached. My fingers twitched as her breath tickled my palm. So close, I thought. She lowered her horn. “Broaam!” The unicorn was knocked aside by a boulder of brown flesh – a troll, a lumpy, misshapen man with curved claws and walrus-like tusks. “Don’t!” I threw myself forwards, grabbing the arm he had drawn back to strike. I staggered as he shook me loose, but at this reprieve the unicorn trumpeted her victory and lunged, burying her horn deep into my belly. 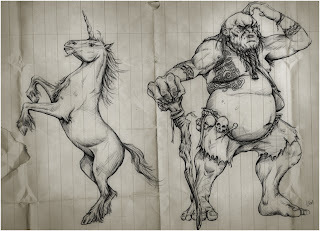 “Broaam!”The troll grabbed the unicorn and flung her; she hit a tree with a sickening crack! I sank to my knees; the unicorn did not stir. I struggled not to faint into the chest of my saviour, half-dead because of the lies my mother read me when I was a child. From the brain of Mark Wilson (@mors_kajak), our first entry about banjos. Enjoy. The house was full of dust, but my cough as I entered was exaggerated, an “Anyone there? !” composed of fear. Not reassured, I moved towards the door at the end of the hall. I had been to that pond this morning. The day was still and hot, but the woodland sounds had died into silence by the time I was twenty feet from the water, and the air seem to hum by the time I was within ten feet, which was as close as I dared approach. I opened the door to the basement, shivering despite the sweat running off me. I descended the stairs, my attempt at a further cough only a quite rasp. As I entered the basement, I was greeted by a tableau of terror. 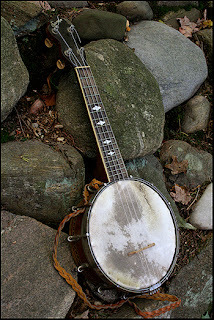 A dozen of the creatures, frozen in polite rictus, each with one of grandfather’s banjos clutched in dead hands, the rusted capos still clamped round the third fret. Their heads were bowed to the empty chairs, as if still receiving echoes of long-ago applause, the floorboards around their feet stained from where the pond fluid had spilled from their heads. Desperately contrived and unamusing (except to me) sort-of Latin pun. I expect there are bonus points for that….